At his practice in Manhattan, Dr. Rahman helps patients from New York City stay healthy with travel vaccines and immunizations for school, work and sports. "He is genuinely concerned about what's going on with his patients. " "Very well trained and professional staff "
"He was very attentive and addressed all of my concerns. " What types of vaccinations and immunizations are available? Travel vaccination requirements can var by region and even by country. We provide patients with vaccinations for all their travel needs, beyond what's included on this list. Why do I or my child need to be vaccinated? Vaccinations provide important protection against many types of serious, debilitating and even deadly diseases, above and beyond what the bod's natural immune system is able to handle. Some vaccinations help supplement our natural immunity, while others helps us become immune to diseases for which our bodies have no natural immunity. Vaccinations aren't just important for your own personal health; they also help prevent the spread of disease from one person to another. I had immunizations as a child. Do I still need to have new ones? Some childhood vaccinations are developed to provide a lifetime of immunity, but many immunizations require “booster” shots to help maintain immunity as you get older. In addition, changes in diseases can also make some older immunizations less effective, and having injections of more modern vaccines is necessary to remain immune. Can vaccines make me sick? Vaccines may cause some mild flu-like symptoms or mild fever for a day or so following injection; these are natural reactions that occur as your body begins producing the antibodies that will provide you with immunity. You will not “catch” the disease for which you're being immunized. We accept major insurance plans. If your plan is not listed, please contact the office to learn more. 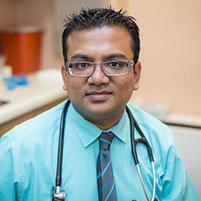 "Dr. Rahman is an excellent physician. He was able to diagnose my medical condition on my first visit and provide the correct treatment. " "Dr. Rahman has a warm aura that makes him easy to talk to and gives the impression that he genuinely cares about your well-being."